Split Tunneling introduced to Flexconnect APs in WLC7.3.x releases. This will allow certain traffic to be locally switched & all other traffic to Centrally switch from a Flexconnect AP. In this post we will see how this feature can be enabled & use it in Office Extend- Home user scenario. This feature works little bit differently with OEAP 600 series AP & will look at that in a separate post. In this post I have used 3502 AP model converted into Office Extend mode. Below diagram shows a typical home users network connectivity. There won’t be an OEAP in normal set up, I have added it here since it is the primary focus of this post. Once you changed the AP mode to Flexconnect & priming it for your corporate WLC (typically in a DMZ) it is ready to give to end user to plug it into his home network. Then it will give him the corporate SSID available at his home. If you are giving end user the capability of creating their own personal SSID then you can enable “office extend” feature on the AP itself. Refer this post to see how you could do that. Prior to 7.3.x all corporate user devices traffic go back to wireless controller in their corporate office. In other words if that user connected to corporate SSID, he cannot access his local network devices (like printer, home PC, etc). Some times user want to print to his home printer while connecting to corporate SSID. This leads to enable this “Split Tunnel” feature on WLC software. This is how it works. Let’s say you have setup your home personal network to 192.168.x.x (private network). You have completely different network at your corporate office (let’s say 131.172.x.x/16). Therefore when you connected to your office SSID while you are at home you will get 131.172.x.x range IP. If you are trying to access 192.168.x.x, from those IP, that traffic will go back to WLC & then it will drop since those private IP cannot routable across internet. Once you enable split tunneling feature with defining ACL to classify what traffic need to locally switched, you can reach your home network devices while you are connecting to office SSID. Here are the steps you need to follow. My wireless controller running with version 7.5.102.0 & you may see little bit different screens in your controller if version is different. First you have to define a FlexConnect ACL to classify your local traffic. You can do this in GUI vial “Security -> Access Control List -> FlexConnect ACL-> New“. I have defined a ACL called “Flex-Split-Tunnel” like below. I have specified any traffic destined to 192.168.x.x to be treated as local traffic. Then you need to create a FlexConnect Group & map this ACL to the WLAN you suppose to advertise via OEAP. You can do this in GUI via “Wireless -> FlexConnect Groups -> ACL Mapping -> WLAN ACL-mapping -> Local Split ACL Mapping” section. In my case I have created a group called “LTU-OEAP600” & map “Flex-Split-Tunnel” ACL to two corporate WLAN named “eduroam” & “LTUWireless2”. (WLC) >config flexconnect group ? (WLC) >config ap flexconnect ? policy         Add/Deletes policy flexconnect ACL on AP. vlan           Enables/Disables VLAN on the flexconnect. web-auth       Maps Web-Auth/Web Passthrough ACL to WLAN for an AP. (WLC) >config ap flexconnect local-split ? (WLC) >config ap flexconnect local-split 1 ? (WLC) >config ap flexconnect local-split 1 OE-AP013-RasikaN ? (WLC) >config ap flexconnect local-split 1 OE-AP013-RasikaN enable ? (WLC) >config ap flexconnect local-split 1 OE-AP013-RasikaN enable acl ? Then you can add FlexConnect AP into this group. If you tick the “Select AP from current controller” option it will list down all the FlexConnect AP in that controller where you can choose from. In my case I have put my home OEAP in to this group. acl            Configures Access Control Lists. group          Configure flexconnect group tables. (WLC) >config flexconnect group LTU-OEAP600 ? ap             Configure flexconnect group AP information. local-split    Config local-split acl on Flexconnect Group. policy         Config policy acl on Flexconnect Group. vlan           Config Vlan on Flexconnect Group. web-auth       Config web-auth acl on Flexconnect Group. wlan-vlan      Configure Wlan-Vlan mapping on flexconnect group. (WLC) >config flexconnect group LTU-OEAP600 ap ? add            Add AP <MacAddress> to flexconnect group table. delete         Delete AP <MacAddress> from flexconnect group table. (WLC) >config flexconnect group LTU-OEAP600 ap add ? By using following CLI you can verify your configurations. acl            Display system Access Control Lists. group          Display flexconnect group information. office-extend  Display flexconnect OfficeExtend AP information. (WLC) >show flexconnect acl ? summary        Display a summary of the Access Control Lists. detailed       Display detailed Access Control List information. (WLC) >show flexconnect group ? detail         Display detail for a specific flexconnect group. summary        Display list of flexconnect groups. Once you do this you are ready to test your feature. 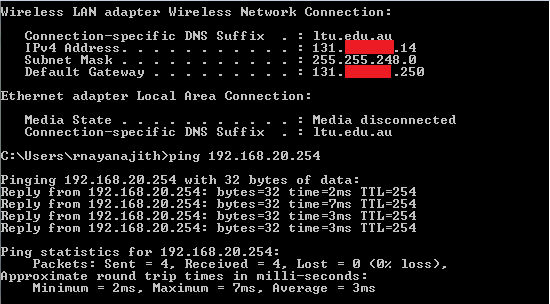 As you can see my client get 131.x.x.14 IP, but still I can reach my local network 192.168.20.x at home. It is working fine, How can you see what changes it makes on the AP config once you enable this feature. “show derived config” is the CLI command you need to run on AP console to see config changes pushed by WLC to AP. Here is the relevant section of this output (not all). As you can see it will create NAT configuration with ACL defined for Split Tunneling (similar config you use in IOS device to configure split tunneling). speed  basic-12.0 18.0 basic-24.0 36.0 48.0 54.0 m0. m1. m2. m3. m4. m5. m6. m7. m8. m9. m10. m11. m12. m13. m14. m15. In next post we will see how this feature works in OEAP 600 series. 1. WLAN is central auth and centrally switched. 2. Internet traffic routed to branch internet only and will not pass through HQ where WLC is located. The reason for the scenario is to enable local client profiling from the WLC because if WLAN is locally switched, local client profiling does not work. If this is possible, may I have a guideline on how to do this? Did you ever figure out a solution for this scenario ? I am faced with the exact same issue. I just tried to deny corporate subnets in the Flex ACL before allowing any destination (branch and internet) traffic. That worked for me. Can you answer on question? Yes, this is possible only from WLC 8.0.x onwards where you can route internet traffic from branch internet link instead of tunnel to HQ. Only interested traffic can be tunnel back to HQ. Can you give an example of the configuration you would need in order to split tunnel the local network and internet traffic? We don’t want to back haul our officeextend users internet traffic back to HQ. Thanks! All of my blog post related to AireOS 7.0. x code specific. Can you point me in the direction of that configuration guide? I am having trouble finding it. In a WLC, I could see APs are in flexconnect mode, on WLAN – local switching is enabled, VLAN mapping is also done. perhaps as the APs are in AP groups where one of the dynamic interfaces from WLC is mapped. Users are getting IP addresses from this interface subnet. So can we say AP group is overriding local switching in this case? Running 8.2 on my WLC, trying to get this working for the new 1810 OEAP. I’ve followed the steps above through the GUI, checked the settings in the CLI, and it looks fine. However, I’m getting my office IP and cannot ping my home network. Thoughts? Haven’t work with this AP model to see if feature works as expected. Sorry, my comment is off the track. Do you have any document on Flexconnect group radius server. I have a setup where I have ISE PSN in branch and I want my branch wireless corporate users to be authenticated with local ISE PSN. We have centralized wlc and single corporate ssid. I am unable to make it work…always branch users to get authenticated through global Radius server which is mapped under SSID. Hi Rasika, We are facing an issue with our wireless Network. We have Cisco 5508 controllers in HA mode with 200 APs in Flexconnect mode. Issue is when ever we perform any changes on any wlan, all our wireless clients get disassociates for few seconds and joins back…we can feel the disconnection if we are working on remote desktop connections…As far as my knowledge only those users will get disassociates which are connected to the ssid on which I am making changes. Not all SSID users. Please let me know if you have seen this kind of issue ?